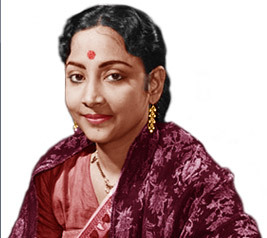 Many if not most of the music lovers of old Hindi Film music may not be aware that Geeta Dutt has sung some really sweet and melodious non-film (private) songs in Hindi. In late forties and fifties, playback singers singing private (or non-film songs) was probably not a very popular thing. Since the medium was 78 RPM records, most of the times, the artists would record and release two songs at a time which would form two sides of that record. Geeta Dutt has sung about a couple of dozen odd non-film songs in Hindi (and some more in Gujrati, Bengali, Punjabi and Marathi). Though these are quite less in number compared to the Hindi film songs (which are approximately 1200), yet there is a good amount of variety in her non-film songs. Probably one of the relatively known non-film song would be “Haule haule hawaa dole”. Those who are familiar to the era of the 78 RPM records would remember that the other side of this disc had the religious song “Jamunaa ke teer kanhaa aao”. Both of these songs have been composed by the distinguished tabla player Pandit Nikhil Ghosh, younger brother of famous virtuoso of Hindustani classical music on the transverse flute, Pandit Pannalal Ghosh. The lyrics were penned by Bharat Vyas. “Haule haule hawaa dole” begins with Geeta almost whispering the words “Haule haule..haayein dole” in her dreamy voice. The rhythm picks up and we have this fast paced song rendered so effortlessly by Geeta. It is kind of surprising that a song where the girl is calling for her “King of hearts” and is saying “saawan suhawan aaya, piya mere tum naa aaye” is not a slow and deeply expressing song. Quite unlike the opening words, the song is far from a "Haule haule" song. It is very fast-paced. This was one of the few non-film songs that one could hear very frequently on the radio in the late forties/early fifties. The Bengali nuance/accent in her voice is quite manifest and, if anything, it makes the song even more enjoyable. This also negates the (wrongly) oft- expressed view about Geeta's early singing style that "Gaati to achha hai magar roti bahut hai". The delight of anticipation suffuses this song with a unique charm all its own. The beats of Tabla before the words “Ghan ghan badaraa gaaje, jhan jhan paayal baaje” are simple indication of the genius of Pandit Nikhil Ghosh. It is kind of surprising that these are the only two non-film songs composed by this maestro for Geeta Dutt. Most of the traditional non-film songs in late forties and fifties would be either bhajans or ghazals. 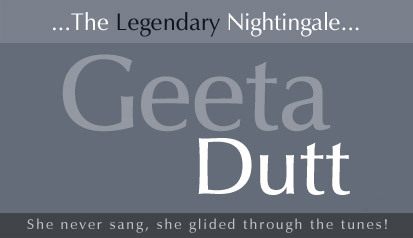 Geeta has not sung much of pure ghazals but she has definitely sung some melodious bhajans. Listen to “Jamunaa ke teer kanhaa aao” or “Kaanha teri baansuri, baansuri teri jaadu bhari”. The huge success of the bhajans of Geeta in the film Jogan (1950) might have had some influence in her singing these non-film bhajans. Both the above mentioned bhajans have deep expressions and have been soulfully rendered by Geeta. In “Jamunaa ke teer” the way she says “Aaao”, conveys the right mood and the feelings of Radha. (On similar lines to the singing of the word “Beeet” in the evergreen song “Mera sundar sapna beet gaya” from Do Bhai (1947), composed by Burmanda). Her expressions convey the eagerness of Radha for her “Kaanha” and her “tadap”. Another bhajan which is sung in a very traditional way is “Kaanha teri baansuri, baansuri teri jaadu bhari”. The lyrics are penned by Anjan and composer is Shyam Sharma. There are more bhajan style/traditional songs like “Daras dev naa prabhu”, “Yeh reet kahan seekhi mohan” and “Rang daalo”. Talking of “non-bhajan” private songs of Geeta, probably the most unique and melodious light songs are two gems composed by Vistas Ardeshir Balsara (V. Balsara). V. Balsara was known among friends as 'The gentleman musician'. He was a Veteran musician, who gained legendary status for his ability to play numerous instruments with equal elan. The Geeta Dutt non-film songs composed by V. Balsara we are referring to are none other than “Yeh hawa yeh fiza yeh baharein” and “Gayein gayein gayein”. The honey-filled voice of Geeta creates a magic in both of these songs. Like his many other songs, these two gems composed by Balsara were influenced by western music and has great notes of piano, the instrument in which Balsara is considered an icon. “Yeh hawa yeh fiza yeh baharein” begins with a sweet humming and then Geeta starts singing. The tune is non-conventional and the words simply float. When she sings “Thandi thandi pawan aa rahi hain” one can truly feel the cool breeze touching the senses. This is a must listen song for any Geeta fan. Arguably her sweetest and most magical non-film song! The other song “Gaayein gaayein gaayein naye zamane mein hum aao naye taraane gaayein” also begins with a chorus and then the tempo picks up. Balsara’s composition creates great fusion of western music and Indian melody. This one is in complete contrast to the song “Yeh hawa yeh fiza yeh baharein” in the mood. These 2 songs composed by V. Balsara are enough to prove that Geeta Dutt’s voice could render a wide range of emotions and had an inner fire that vindicated the song’s existence. The opening music of “Kuke ambuva pe koyaliyaa” can remind the listener about the music of melodious compositions of Sudhir Phadke or Vasant Prabhu for Marathi film songs in the fifties. The “Koyal” Geeta sings this song about various aspects of the season of “Phagun”. 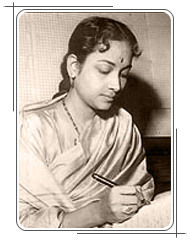 One of the most important national song “Vande Mataram” was sung by Geeta Dutt (with G M Durrani) as early as 1950. This was even before it was sung by Lata ji for the film Anand Math (1952), composed by Hemant Kumar. Geeta also sang a non-film song “Chanda hanse hans rahi chandni” with Talat Mahmood. Very little information is available about the rest of the songs and the audios of most of them are not available.